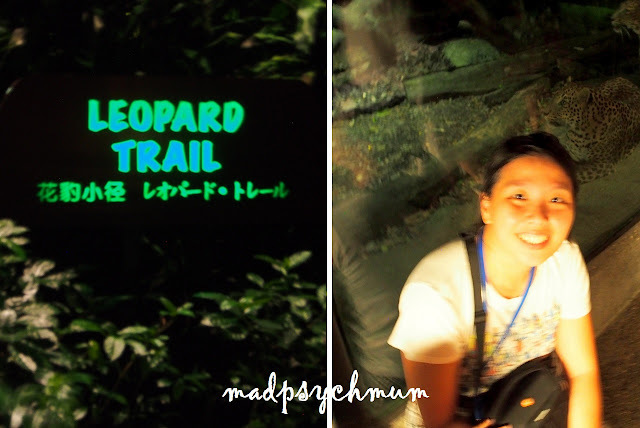 It had been a decade since I last visited the Night Safari and had always wanted to bring my kids to visit. We finally managed to and had a great time! 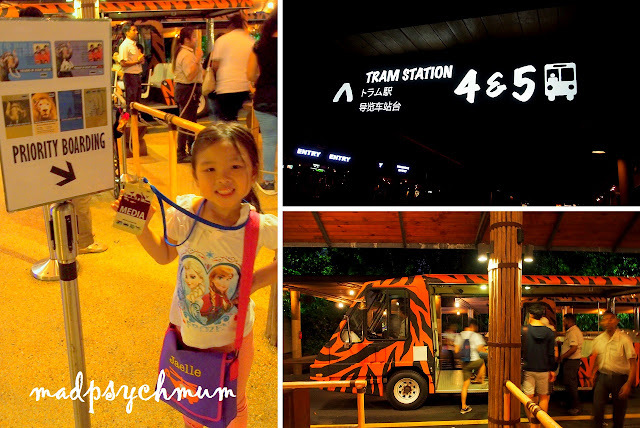 Our first stop was the Tram Station, where we will board the tram to see the whole park. It's a must to take the tram because certain parts of the park (e.g. giraffes, elephants, etc) are not accessible by foot. The trams are exactly the same as those in the Singapore zoo! It's times like this when I wished that I had bought a lens meant for night-time photography. I couldn't capture most of the action because we can't use flash photography as the light is harmful to the animals. You'll just have to bear with whatever blurry photos I managed to take (which is still amazing already considering how pitch dark it was!). The tram ride was amazing! We saw a lot of animals and most of them were awake and active. It was also the first time I heard the lion roar I think! Lovely experience for the girl and I (the boys not so much -_-). However, I did take issue with the contradiction between the conservation message we keep hearing on the tram and the booth selling printed photos of guests on the tram. Why is the Night Safari still printing physical photos when there are digital ways to display the photos nowadays? Hopefully, it was temporary. Zebra crossing in actual zebra stripes! We started with the Fishing Cat Trail, which led to the Leopard Trail where we wanted to go to see the leopards. Each trail will take about 20 minutes so do be strategic because you want to be back in time for the Creatures of the Night Show. Got up close to two leopards! So close that we could see their whiskers. If you want something more thrilling, you can enter this Mangrove Walk with flying fruit bats everywhere. The very active lions pacing around and roaring to every tram that passed by. I suppose it was dinner time maybe? 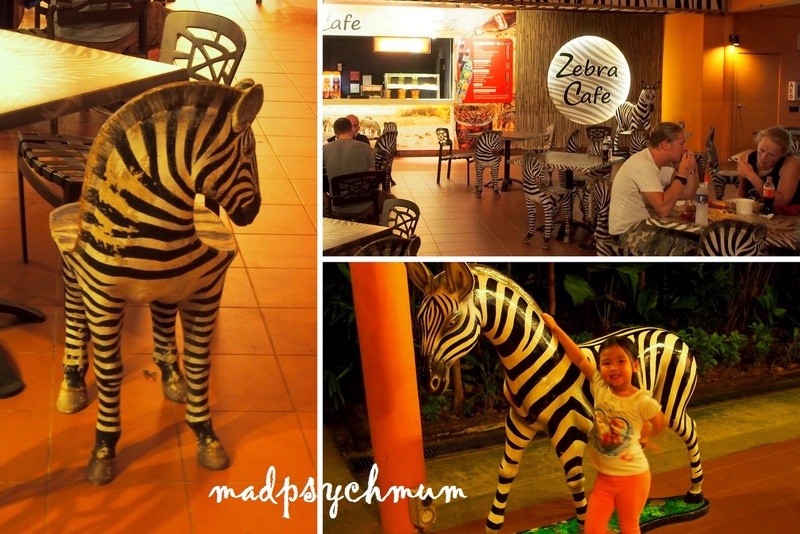 We decided to walk back to the Main Entrance via the East Lodge Trail and passed by a very cool Zebra Cafe. I found out only later that the giraffe enclosure was actually very near to the Zebra Cafe! But we had given it a miss because I had thought it was further away and we didn't have time (*sigh*). In any case, we saw the Malayan tigers and spotted hyenas at the East Lodge Trail. Luckily for us, it was feeding time for the hyenas so we got to witness them running and fighting for their meal. Was quite a sight (I tried to video it but the enclosure was just too dark)! The East Lodge Trail led to the Wallaby Trail where you can come up close to free-ranging wallabies. We gave that a miss because we had seen plenty of them on our trip to Melbourne last year. We reached the Amphitheater just in time to catch the Creatures Night Show at 9.30pm. Despite the slight drizzle and our crappy seats, it was a pretty entertaining show albeit a little too short! Thumbuakar Show where macho guys toss, blow and eat fire! It's so entertaining that even the hubby likes it! We decided to meet up with the bro-in-law and sister-in-law for supper at one of my favourite supper places in Singapore, Chomp Chomp Food Centre. One of the stalls there serve my favourite stingray that I can't eat anywhere else (I don't have a photo of it because it ended up in my stomach before I remembered to take a photo *laughs*)! 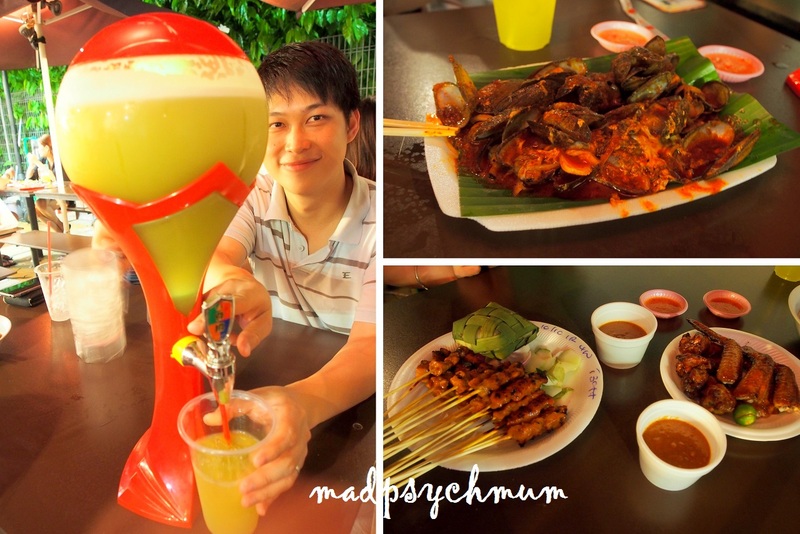 Disclosure: Media passes to the Night Safari was received from Wildlife Reserves Singapore for the purposes of this review. No monetary compensation was received; all opinions and text are my own.